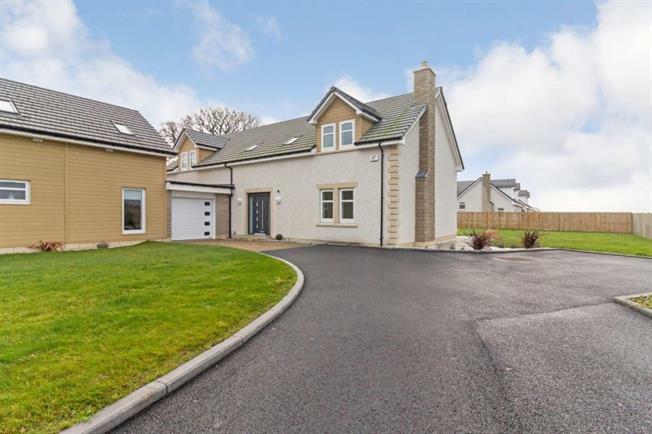 4 Bedroom Detached House For Sale in Falkirk for Fixed Price £495,000. Stunning bespoke development of only 5 executive detached villas in a private gated development with stunning views across the open countryside. The developer Forth and Clyde homes has beautifully presented the development to compliment the incredible open space with all bespoke villas having uninterrupted views. Each separate property has been finished to an exact luxury specification befitting of this superb development catering for all aspects of family life. Plot 3 is situated right in the centre of the development and boasts exceptional landscaped garden grounds. The executive accommodation flows over two levels to offer a versatile layout that includes two formal reception rooms, stunning modern fitted kitchen with dining and living space, utility room, four bedrooms, two en suites, family bathroom and cloakroom. In terms of location the backdrop to the development is simply stunning. However there are local amenities nearby including fantastic schools and excellent commuting links to Edinburgh, Glasgow and Perth. For the golfing enthusiasts Falkirk Tryst, Stirling golf club and the world renowned Gleneagles are all within easy reach. Plots 1 and 2 have been sold with plot 3 now released with plots 4 and 5 to follow shortly. There are a host of extras in each individual property as well as a range of incentives that we will be happy to discuss with any interested party. There is a stunning show home that is available to view by appointment only both during the week and at weekends. There are 2 links below to show the video of the full development.